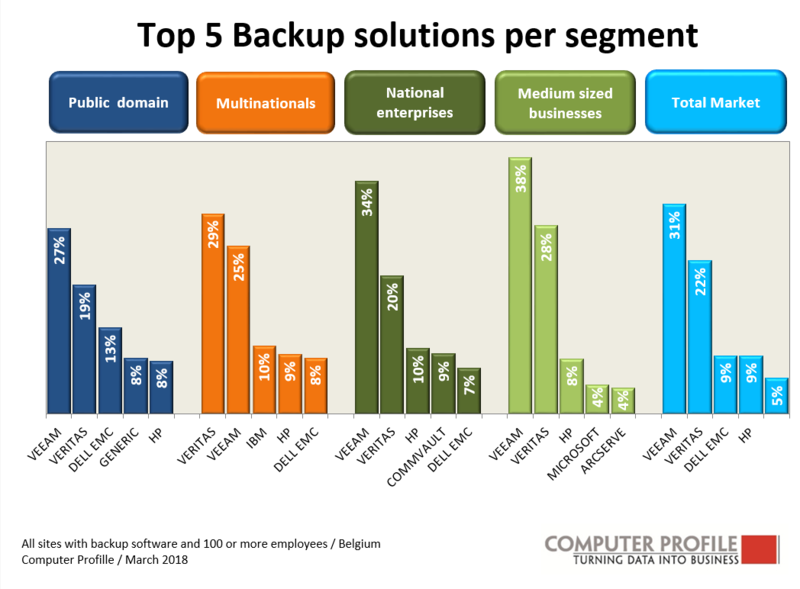 VEAAM has grown into the market leader in back-up software in Belgium in just eight years. HPE remains the most common storage vendor. This is shown by a market analysis conducted by market intelligence specialist Smart Profile,for which more than 1,093 Belgian companies with more than one hundred employees were surveyed. Nearly 91% of the respondents use back-up software. Most of them have installed the VEEAM software. VEEAM has registered growth exceeding 30% since 2010 (<1%). The organization seems to benefit from the relentless decline in the share of Symantec/Veritas. In 2010, 42% of the companies still used Symantec back-up software, but in 2018, now under the Veritas label, that figure is only 23%. Nevertheless, Symantec/Veritas is still the second largest vendor on the Belgian market. Other companies that have registered a striking decline are CA, now ArcServe (from 17.8% in 2010 to 2.4% in 2018) and to a somewhat lesser extent HPE (from 13.2% to 8.2%). The other vendors obtained a comparable market share or registered an increase. When we look at the market segments by company size, VEEAM is once again the most widely used software, except among multinationals where Veritas has the upper hand. 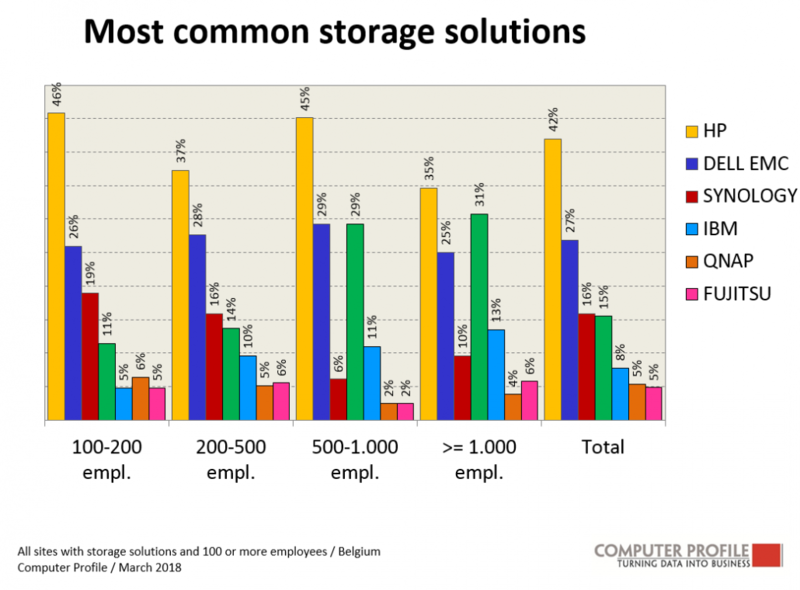 Smart Profile analysed also the storage systems used in Belgium. Three storage types are combined here: SAN, NAS and tape storage. HPE remains the most common vendor with 42%, just like in previous years, with Dell-EMC in second place (26.9%). One player that has managed to edge its way into third place is Synology. This vendor provides low-threshold solutions on the market which are often used by SMEs as well. This vendor was completely unknown in 2010, but in 2018, 15.9% of companies use its storage systems. NetApp ranks fourth with 15.5%. This share has remained relatively stable over the years. At issue for all vendors here is the penetration rate and not the effective market share (in share of wallet). Large companies where expenditures can run to several hundreds of thousands of euros will opt for classic names such as Dell-EMC, HPE and NetApp.